War erupts once more in the ravaged land of Khorvaire, as a barbarian horde spreads from the west across the pristine forests of the Eldeen Reaches and toward the capital of Aundair. Meanwhile, the shadows of Fairhaven conceal plots against the throne, as Aunn tries to unravel the tangled threads of Haldren's plans before it's too late for Aundair and the queen. In the end, only the Storm Dragon can stand against the horrors of the Blasphemer—but will his power stop the barbarian advance, or destroy the world he tries to save? Learn more about Dragon War at the Wizards of the Coast web site. 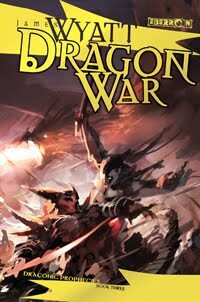 Dragon War was released in August 2009 in hardcover.